If you see it, you can be it!! So you decided you wanted to play tennis, or maybe you picked up a racquet years ago. Its super fun just to get out and hit balls, its aerobic, its anaerobic, it’s challenging. No matter what level you are at you will find a stage where your improvement plateaus, why am I losing to the same guy all the time? There are always good reasons why you are stuck, but no one will argue it’s good to be good. A little science to help!! The big game changer here is our friend the Mirror neuron. The brain using an amazingly complex series of electrical impulses and chemical reactions make aces fly and volleys volley. When we perform a skill neurons fire and throw down an action plan that the body carries out through bone getting pushed and pulled by muscles. A new kid on the block is the Mirror neuron. Found in 1980 by a group of Italian scientists poking their tongues out at monkeys it has lead to a whole new set of things to argue over. Ramachandran thought that mirror neurons have been the driving force behind the great leap forward in human evolution. There is still arguments the over full extent of its involvement in emotion, learning, even telepathy? For our purpose we do know it fires as the neuron fires in response to performing an action. The cool thing though is it also fires when you see the action being performed by someone else. As always there is a Catch! The Mirror Neuron will only fire if the action has a goal and is similar to something you already have had experience with. I can absolutely appreciate and enjoy Jimmy Hendrix banging out the star spangled banner with his teeth. Though having my music career peak in grade school with chopsticks on the keyboard, I don’t have much in the way of a connection to how complex his skills really are. Mirror neurons will only fire if the brain recognizes the goal of the movement. Now something more in my wheelhouse has a completely different effect. Seeing the Pete Sampras slam dunk an overhead, the Pat Rafter volley or even the Roger Federer Hop, that makes me want to run out and grab a racquet. When there is a way to connect the map of how I feel my body move and what I see moving in another person, a whole bunch of things start firing in my body. The conclusion is you absolutely can improve on a skill by seeing it performed. Now can I get Federer’s forehand from watching him on TV? Probably not! You can dig it, but you more than likely don’t have the connection yet between your brain and body to really feel what you’re seeing. 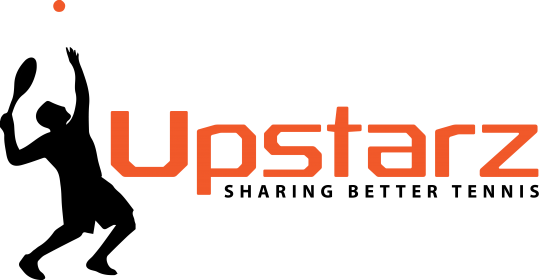 The Upstarz project is driven to share every type of swing out there. There is no wrong swing if it works, but there is better. Knowing where you are in your journey is key to figuring out your next goal to take care of. Using the Tennis Levels you can get an idea of where you should fit in. Seeing players close to your skill level can help clarify what you are doing well. Seeing what people in a higher category can help you feel your way to better tennis. We are connected at the hip with technology in every part of our life giving us access to experiences we otherwise wouldn’t get. Now there can be no substitute to actually getting out in the sunlight and hitting tennis balls. Its how you get better and the reward all at the same time. But if it’s a rainy day, or a spare minute in the day, I have to take advantage of every tool I can to get the edge. So add a little time each week and watch a video in your profile. It might might make all the difference in your next match.